Policy-based Assertion Attributes: Attribute values can be created on-the-fly depending on the result of the policy. 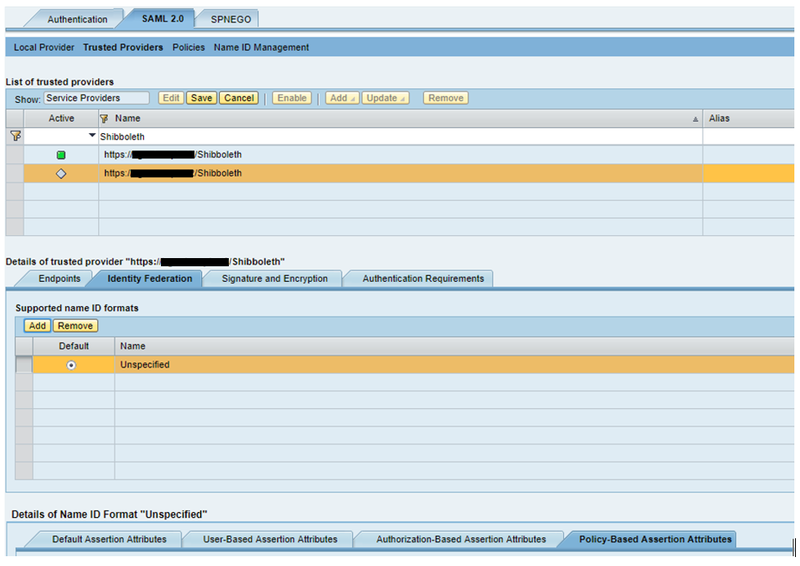 For example, custom SAML attributes which uses existing user attributes or environment values. In this blog, I wil create a simple policy script to create an attribute which does not exit in the UME. Scenario: SAP Business Objects BI Platform 4.1(BO) is configured as a Service Provider (using Apache HTTP Server and Shibboleth) and SAP NW Java(SAP IdP) is configured as an Identity Provider. 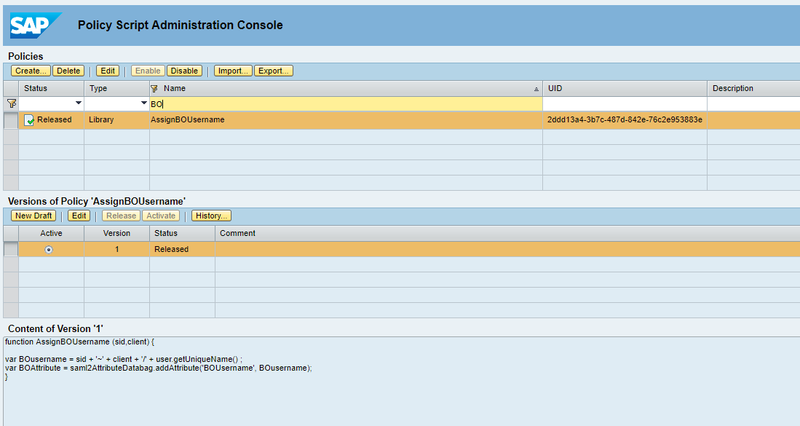 BO uses BW as a user source and SAP IdP uses Active Directory as a user source. 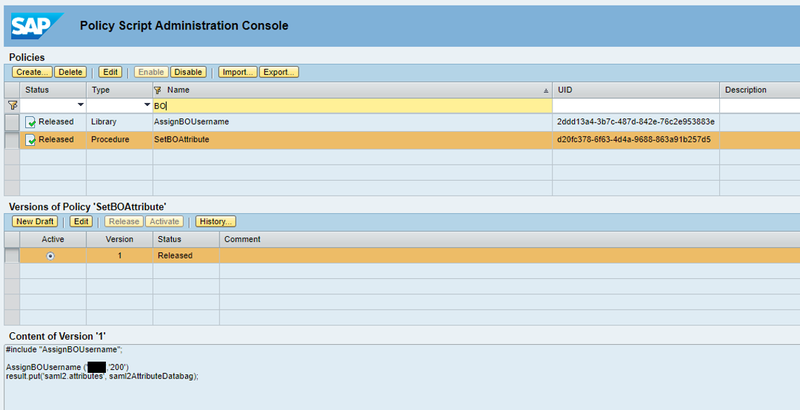 Trusted Authentication is enabled on BO server, hence BO expects username in the REMOTE_USER variable. An example username in BO is aakbal, but its value in BO CMS DB is <BW_SID>~<BW_Client>/<username> which is SID~200/aakbal in this scenario. Therefore BO expects REMOTE_USER variable to be SID~200/aakbal . However this value exists neither in AD, nor in SAP NW Java. Somehow, we have to create this attribute on-the-fly and pass it to BO Server. You can also manipulate Shibboleth or Apache Configuration and add “SID~200/” value before LogonID, but it is not easy to concatenate strings in the xml format, and you cannot manipulate SAML token. Therefore I must do this operation on IdP side. 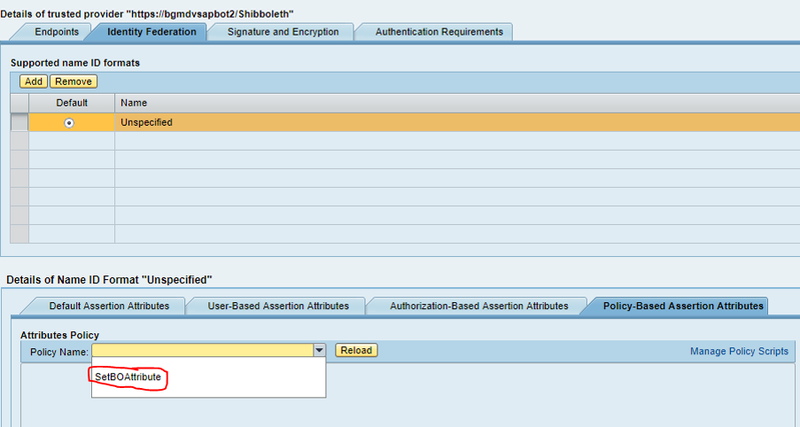 AD username should be converted to BO username format before sending SAML Assertion from IdP to SP. You need to have RBA_POLICY_ADMIN role in NW Java. I intentionally put a black mark on SID part to hide real SID. Save and Enable SAML configuration. Next time you initiate SAML Authentication ; besides other attributes, SSO Server will send BOUsername attribute in the format specified in the procedure. 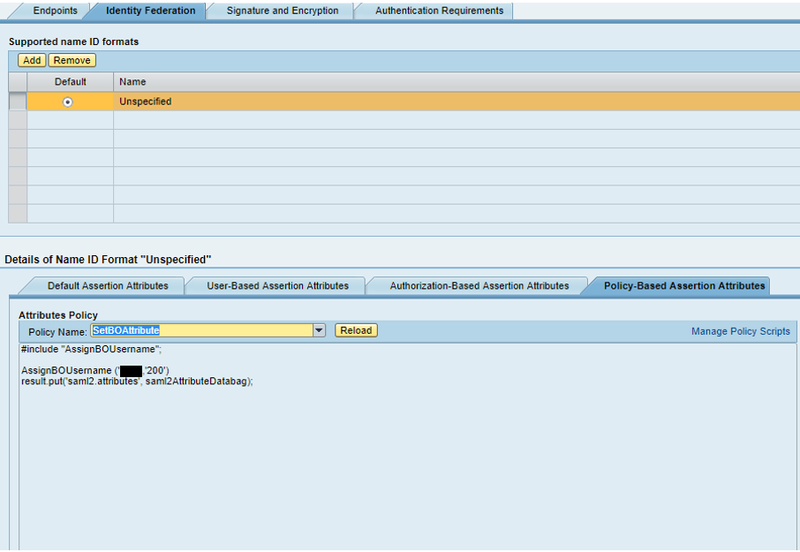 More information can be found in help.sap.com (Configuring Policy Scripts for Identity Provider Extensions ) and SAP SSO Policy Scripts Implementation Guide. Countdown to SAP TechEd Las Vegas is On! Open Source SAPUI5 – Got the T-Shirt? 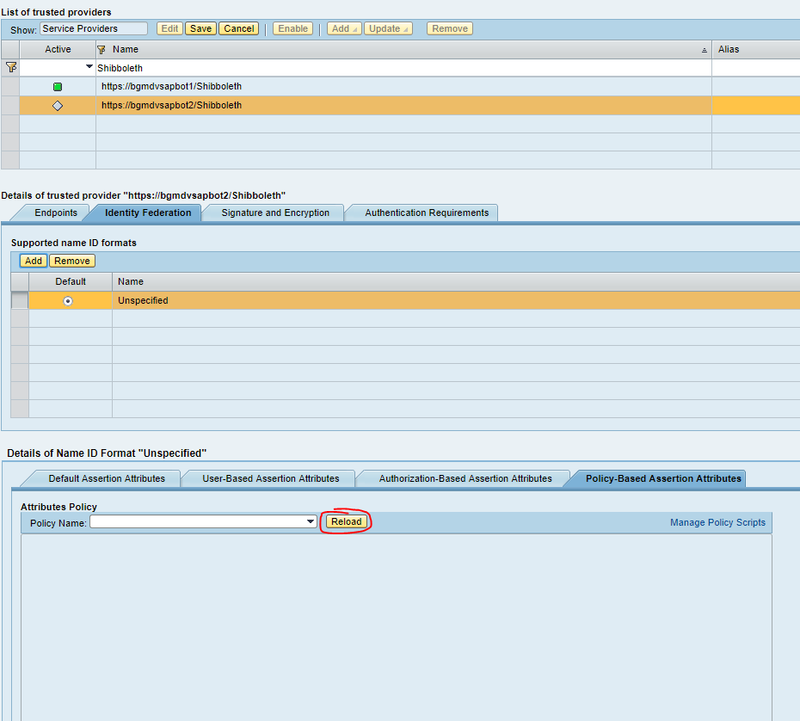 SAP Activate – what is the methodology story?